Another new demo, another new technique specific to Daala: frequency domain prediction of the chroma planes from the luma plane! Predicting the chroma planes from the luma plane isn't a brand-new idea. Still, we're both the only codec to actually be deploying it, and we're doing it entirely in the frequency domain (which is novel). 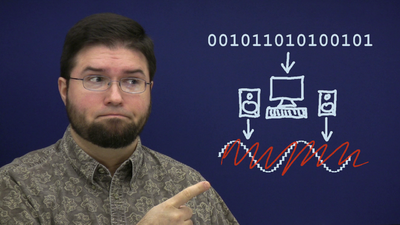 I've just posted part 3 in my demo series introducing the Daala video codec. This one is kind of a long one, mainly because I think it's one of the only really detailed presentations of a technique Jean-Marc Valin of Xiph invented and first introduced in the Opus audio codec: 'TF' aka Time/Frequency resolution switching. Even better... while I was documenting TF for posterity, I spotted a possible improvement. So, I've tossed in documentation of a brand new technique as well! Xiph.Org has been working on Daala, a new video codec for some time now, though Opus work had overshadowed it until just recently. With Opus finalized and much of the mop-up work well in hand, Daala development has taken center stage. I've started work on 'demo' pages for Daala, just like I've done demos of other Xiph development projects. Daala aims to be rather different from other video codecs (and it's the first from-scratch design attempt in a while), so the first few demo pages are going to be mostly concerned with what's new and different in Daala. I've finished the first 'demo' page (about Daala's lapped transforms), so if you're interested in video coding technology, go have a look! If you just said 'Whaa? ', you may want to read the whole article. It's fairly long... but hearing, perception and fidelity are complicated topics. Shysters and charlatans exploit that nuance (and misunderstanding) to bilk unsuspecting consumers of their money, all the while convincing them they're paying for 'quality'. Anyway, happy reading and comments welcome! right/control click on iTunes in the finder, and select "Get Info"
Under General, check the box marked "Open in 32-bit mode"
You should put the above on something linked from: http://www.xiph.org/quicktime/download.html I paraphrased it from roaringapps.com. If XiphQT can be rebuilt in 64 bit mode, and that shipped that way to Lion users, that would also be a good solution. That last comment is actually a bit of an embarrassment for us at the moment; neither the XiphQT builds nor code have been updated since 2009 or so, despite multiple releases, fundamental improvements and new features in the Xiph codecs since. There are actually more recent beta builds of updated Mac OS X and Win32 XiphQT components than never got bumped to the official XiphQT download page, but even these builds are from mid 2009. We don't have any high-powered Mac OS hackers in the core Xiph group at the moment. I have some relatively insignificant amount of experience coding for Mac OS X and Quicktime, but I've been hoping for a volunteer with more chops. Any takers? I made a quick change to the Xiph.Org front page that a few people have suggested now over the past few years. The top few blog posts aggregated by Planet Xiph now appear as a five-item teaser list near the top of the Xiph.Org home page. The idea is both to get some more live content on the front page as well as to draw more attention to both the Planet and our developer community. Quite a few otherwise interested people may not have heard that the FTC (Federal Trade Commission) is holding a panel and workshop next week concerning how patent trolls are abusing standards body processes. This is our field, and we didn't find out about it until end of last week. Regardless, Xiph.Org has assembled an official comment document, and will be represented in person by at least Dr. Tim Terriberry and possibly a few other core members (I won't be there). If you're interested in software patents, some of the US Government's thinking on the issue, and participating in the process, have a look at the above two links. Also, feel free to distribute our comments far and wide. It's somewhat more gripping than the usual, dry "Percy Q. Business Leader Advises the Federal Goverment".